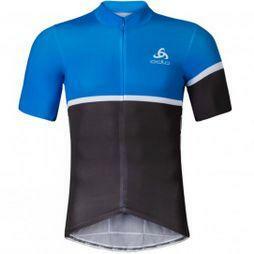 An aerodynamic/race style fit that is also incredibly comfortable and breathable with bold styling, the Kamikaze jersey and bibshort from Odlo are a winning combo at a competitive price. The first thing that hits you when trying on the Odlo Kamikaze jersey and bib shorts is how they really are designed as a pro-style fit. As I am quite short at 165 cm and slim at 60 kg, I chose size small and they fit me like a glove. The fabric is luxuriously, soft and smooth to touch both on the outside and against the skin, but the best part about the fit is the bonded edges. As well as looking much cleaner than stitched sleeve endings and being more aerodynamic, they feel more comfortable, with no digging in to the skin, while still holding their position well. While climbing, I found the breathable back panel was not quite as breathable as some mesh backed jerseys I own, but it did dry out very quickly. The straps on the bibs are a breathable mesh and you can barely feel you are wearing them as they have just the right amount of elasticity. The triple density padding is incredibly comfy on the saddle and is contoured well to give a close fit. I found it was also very quick drying. Overall fit on the shorts is snug and supportive with no bunching up or pressure points – a problem I have found with some equally priced bib shorts. The styling on Odlo's cycle clothing is simple and bold; it really stands out as something a bit different to some of the better known cycle clothing brands. All the stitching and finishing on these garments is excellent (though you wouldn’t expect any less at this price point) and just by holding them in your hands you can tell they’re built to last. Definitely the best fitting cycle clothing I have ever worn, snug and comfy with a really nice feel to the fabric inside and out. Maybe not the most breathable jersey I have ever used but it still did a pretty good job of moving sweat. The pad in the shorts is far more comfortable than some pads I have worn in the past although I haven't taken them for a really long ride yet. 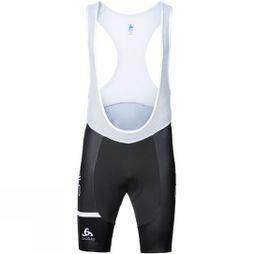 Overall this jersey/bib short combo is good value for money with an excellent quality finish and an eye-catching look. From padding to fabric and flat stitching - here's what you need to be thinking about before choosing a pair. From fabric to fit, sleeves and a dropped tail - here's what you need to be thinking about before you buy. The Italian brand best known for pushing innovation has become the official Team Sky kit supplier for the 2017 season. And you can now get the entire collection here at Cycle Surgery.